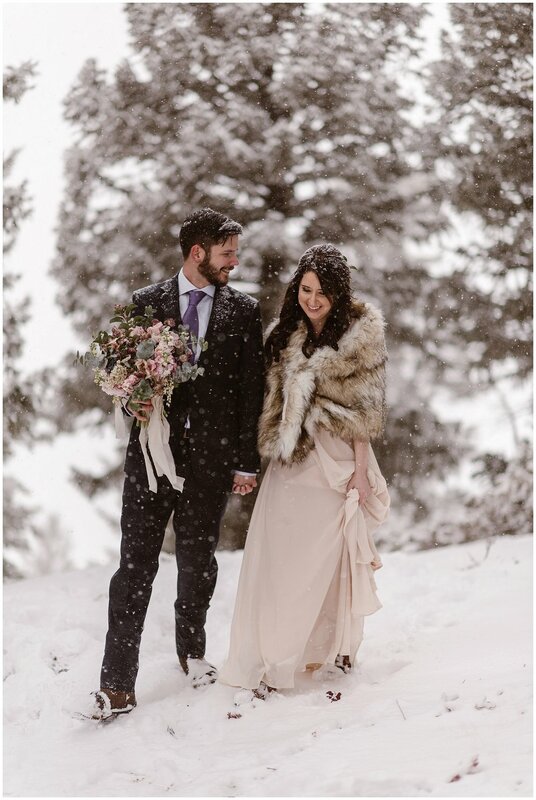 Marlayna and Austin came to Colorado from Louisiana for their elopement because Marlayna dreamed of a snowy winter elopement. The thing about springtime in Colorado is that the weather can do all sorts of things. It can be sunny, beautiful and warm, or it can be a white out blizzard. 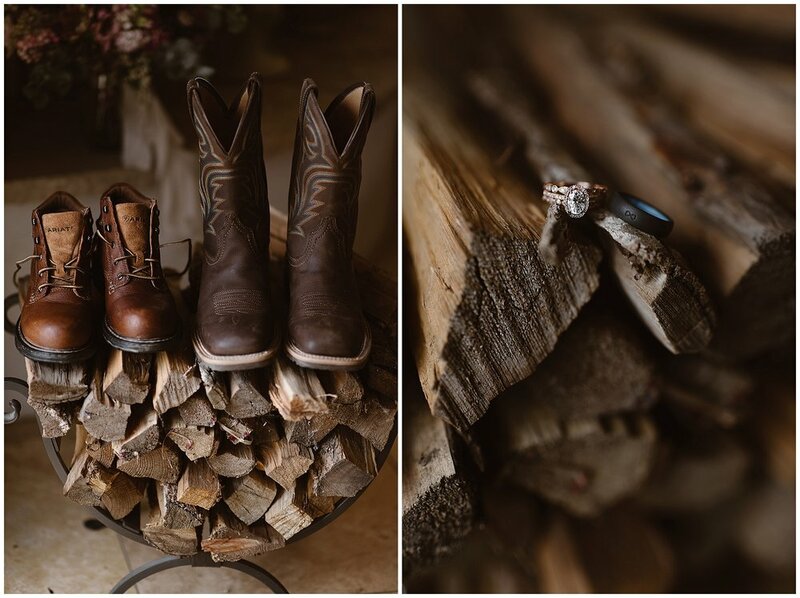 Marlayna and Austin were lucky to experience both of those extremes on their wedding day. As I drove to Georgetown to meet Marlayna and Austin, the weather changed about every ten miles from a beautiful sunny day to a whiteout blizzard and I wasn’t sure what weather we would end up with that day. They chose to get ready separately so they could do a first look. 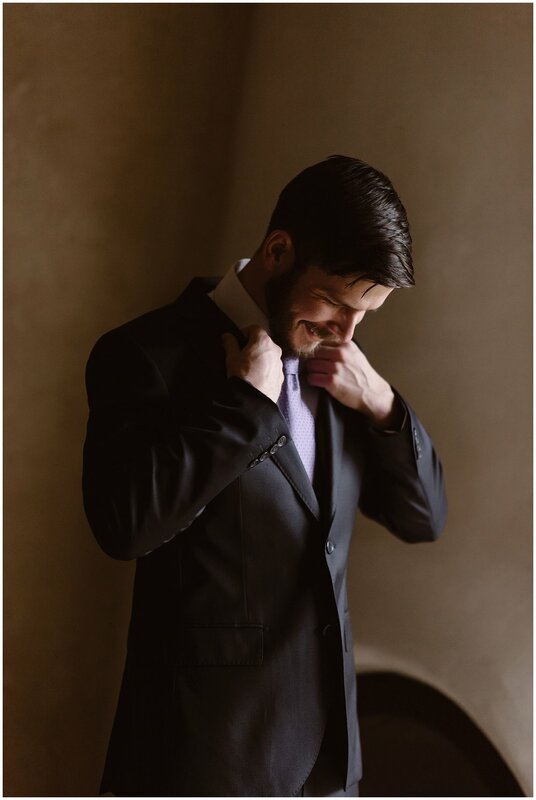 Even with having a non-traditional wedding, it’s still great to create a momentous occasion out of seeing each other for the first time because it is a big deal. I helped Marlayna put on her dress while Austin finished getting ready. We added some flowers in her hair as Austin left to get us snowshoes because we thought we might need them. When he returned to the hotel, we went to a little lake near Georgetown with a peninsula that went out into the lake. We decided it was the perfect spot for their first look. As I was lining them up, we could see a snowstorm barreling across the lake right towards them. As soon as they turned and saw each other for the first time, it started snowing and the wind was blowing. It was very dramatic all of a sudden and punctuated the emotions of the day perfectly. 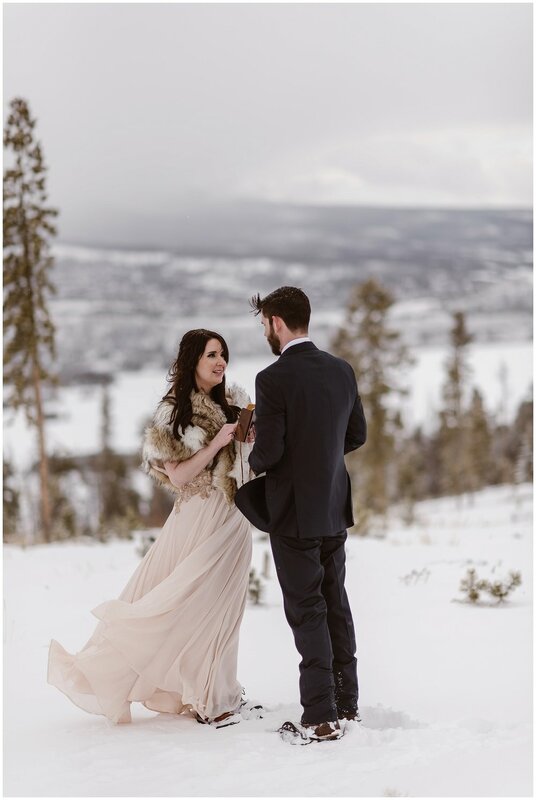 Loveland Pass was their first choice for an elopement space. When we got there, the weather had turned nasty with a total blizzard and extreme winds. In the whiteout conditions, you couldn’t see anything. We got out of the car at the top of Loveland Pass, looked at each other and knew this wasn’t going to work. Their second choice spot of Sapphire Point would have to work. Choice number two ended up working even better than Loveland Pass. It tends to work out that way with elopements. The weather is always a big wild card in photographing elopements outside. I’ve had quite a few elopements that we’ve had to change plans at the last minute because of weather. When planning your elopement, it’s important to have a backup location for this reason. Sapphire Point is a very busy location, even in early spring and during a snowstorm. We explored off the main path for an adjacent spot that wasn’t as busy. It was snowing heavily when we first arrived and we couldn’t see the reservoir or the mountains. We started to climb high and higher, and more of the view started to appear through the trees which were lightly dusted with snow. We had no idea the exact location Marlayna and Austin would be saying their vows. I told them to take their time and feel it out; we had the entire day to find something special and right for them. As we climbed, suddenly, the sun started to peek out, the snow stopped and they just knew this was the place to say their vows. The wind started to blow Marlayna’s dress dramatically as they said their vows to each other. It was emotional and beautiful. No matter what else is going on, when you pull out your vows and promise to spend the rest of your life with your person, it’s magical. Every single time. I tell my couples that they should be the ones to pick their spot, to pick where they’re going to plant their feet and say their vows to each other. It’s a special thing when a couple elopes and it should be theirs to choose. When eloping, you don’t have a venue where hundreds of other people have stood before you. I think seclusion, privacy and quiet are very important for an elopement wedding day. I strive to help all my couples find a spot that’s off the beaten path and unique for their story. You don’t want the spot where you show up and fifty other people are taking the exact same spot. You having stood there and said your vows makes it a place. I always pull out my phone and screengrab the GPS coordinates of the exact spot a couple choose because I think it’s so special for them to know. After their vows, we took more photos of them as a couple. It started to get dark and cold and the other hikers that day started to leave. It afforded Marlayna and Austin more privacy in the mountains on their private wedding day. Marlayna got her wish and they spent their wedding day in the mountains, surrounded by snow, in a scene that looked out of a snow globe.